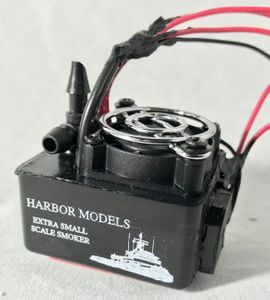 The Harbor Models 6V Small-Scale-Smoker is a great way to add that extra touch of realism to your models. The unit features a brushless bearing fan for efficient and quiet operation, low power consumption, extended run time, compact size and variable output in relation to your motor. Includes one 2oz bottle of Mega Steam™ smoke fluid with your choice of no scent, diesel or coal fired steam. One bottle will last up to 12 hours of smoke with a dipstick to check fluid level. 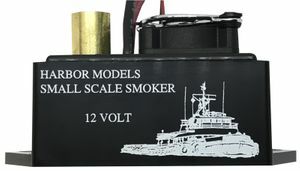 The Harbor Models 12V Small-Scale-Smoker is a great way to add that extra touch of realism to your models. The unit features a brushless bearing fan for efficient and quiet operation, low power consumption, extended run time, compact size and variable output in relation to your motor. 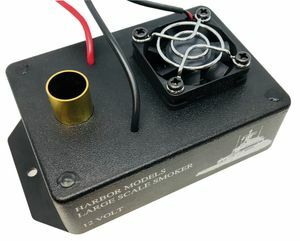 Harbor Models has now released the new EXTRA SMALL SMOKER! The Extra Small Scale Smoke Generator is a great way to add that extra touch of realism to your smaller R/C Models. 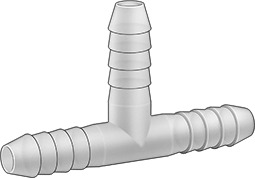 The unit features a brushless sleeve bearing fan for efficient and quiet operation, very low power consumption, extended run time, and a very compact size of 1 1/2” L, 1 1/2” W, and 1 1/2” H without tubing/wiring, and a weight of just over 1 OZ when filled with fluid, suitable for most 24” and under models that offer minimal room for installation. The Low Spill design is ideal for Rock Crawlers that operate at steep angles, as well as Smaller Boats that tend to roll, pitch, or pound. The Extra Small Scale Smoker will put out a fair amount of smoke proportional to their ultra-compact size. Perfect for tiny models of all types. Works great in ships, speed boats, trains, tanks, and even cars! Our new technology allows for this unit to shake, bump, slide, and even roll up to 40 degrees and not spill! 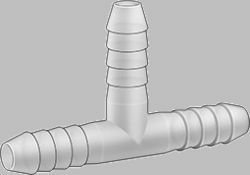 Provided with two feet of 1/4" tubing, two-way tape pre-attached to the bottom for easy installation, an alcohol swab to clean the area for attaching, instruction sheet and one, two oz bottle of smoke fluid (good for about 10 hours of runtime). In order to accomplish the longer run times and lower power consumption the volt limit is important. 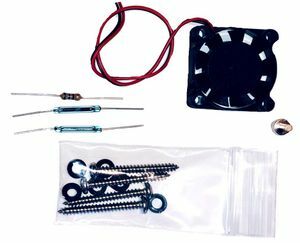 If you have any concern that you may be providing your smoke generator more volts than stated on the unit please use a voltage regulator like the one found below in the accessories list. This unit must be hooked up to the output of a Electronic Speed Control, you cannot hook directly to a battery or power source. Available in three different voltage inputs, choose from the dropdown menu. Always wanted the chuffing effect for your smoke output? Now you can have it! For use with a new or previously owned SMALL SCALE SMOKER, this does not work with the large scale smoke generator. The set allows you to retrofit your small scale smoker with a secondary fan that will give the output a pulsating chuffer effect. Simply follow the provided step-by-step instructions on how to install this directly onto your unit. The highest quality smoke fluid to be had by Mega Steamï¿½! Extra smoke fluid for your smoke generator. This fluid is a petroleum-based product. DO NOT ingest. Keep out of the reach of children and store out of direct sunlight. Use this smoke fluid with all Harbor Models' smoke generators. The highest quality smoke fluid by Mega Steam!